Click above to see a video of Sweet Aliyah reading her very own, one of a kind, beautifully illustrated, Tails Untold Personalized Pet Book. 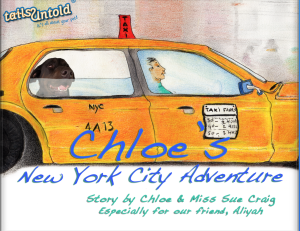 She was so excited when she heard her name and then to see her favorite dog, Chloe, taking a New York Adventure trip and telling her all about it. If you would like to have your very own Tails Untold Personalized Pet Book, where your pet is the narrator and the star, visit www.tailsuntold.com. 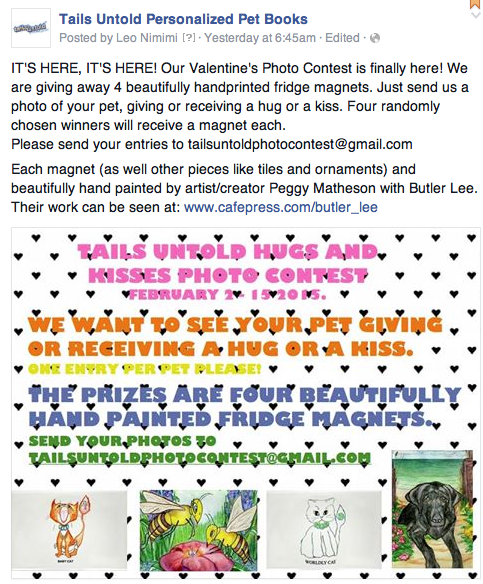 Hey Everyone, Tails Untold Personalized Pet Books is having another great Facebook Photo Contest! To celebrate Valentine’s Day, join in the fun and send in your pet and your “Kissing or Hugging Photos”. What fun! Go to: www.facebook.com/TailsUntoldBooks. 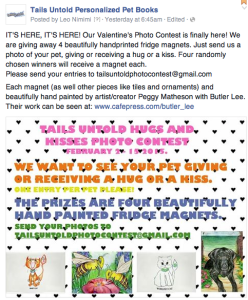 to enter to win a beautiful hand painted fridge magnet created by our wonderful friend and great artist, Peggy Matheson. Please also share this with all your friends! The more kisses and hugs, the merrier! Happy Valentine’s Day!